The yellow-billed kite (Milvus aegyptius) is one of the most common birds of prey on the African continent, and arguably the most visible. It was until recently thought to be a subspecies of the Eurasian black kite (Milvus migrans), but DNA tests has shown they have separated enough genetically to be considered separate species. They are very similar in appearance, and their range overlap when black kites migrate south from Europe and Asia and into Africa during the northern winter. The easiest way to tell them apart is by looking at the beak. 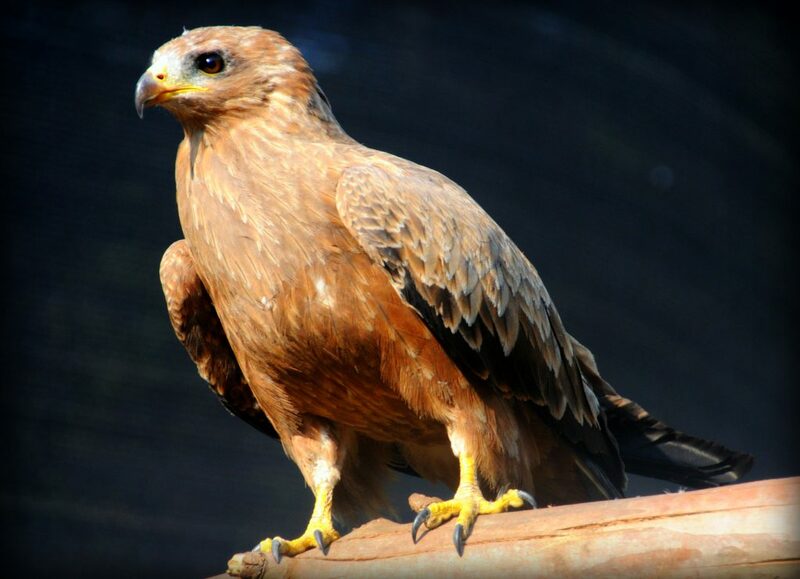 The yellow-billed kite has an all yellow beak, whereas the black kite has a black tip to its beak. It is a medium-sized bird of prey, reaching an average length of 55 cm (22 in) and a wingspan between 160-180 cm (5ft 3 in – 5ft 11 in). It is an all brown bird often with a lighter grey-brown head. It has a forked tail, as is often synonymous with kites although not always the rule. The all yellow-beak is the bird’s most telltale feature, and makes it easy to identify in the field. Yellow-billed kites can be found almost anywhere, and is sometimes more common to see outside of protected areas than within because of a lack of competition from other species. It is, however, also quite common within protected areas. The only habitats avoided by this bird are dense forests, true deserts, and mountains at high altitudes. Urban areas suits this bird well, as it is incredibly opportunistic in its behavior. Diet is varied, and it will feed on any prey small enough to be caught and eaten, such as small mammals, reptiles, birds, and insects. Carrion is regularly eaten, as well as human leftovers and scraps. It is not uncommon for yellow-billed kites to swoop down and steal food from under the nose of humans, sometimes even directly from their hands. It is a migratory bird in the areas where seasons are more varied, and is only resident in tropical areas close to the equator. In southern Africa it arrives in August, before the first rains, and leaves just after the last rain in March or April. It is a gregarious bird, and will sometimes come together in large numbers when food is plentiful. It is not territorial and while some breeding pairs nest solitarily, loose groups often associate during the breeding season. Nests are made up of sticks and twigs and are constructed on tree branches, cliff ledges, pylons, and buildings, sometimes only a few meters away from a neighboring nest. The female lays two to three eggs and incubates them for about 30 days. Chicks leave the nest after 42-56 days, but will depend on both parents for another 15-50 days. The yellow-billed kite is a very common bird of prey and occurs in large numbers in both urban and natural habitats. In some places it is so common that it can be seen daily as it looks for food unperturbed by human presence and disturbance. There are no threats to this species and although it is not yet separated from the black kite by the IUCN, there are no reasons to belive it would have any other status than least concern.